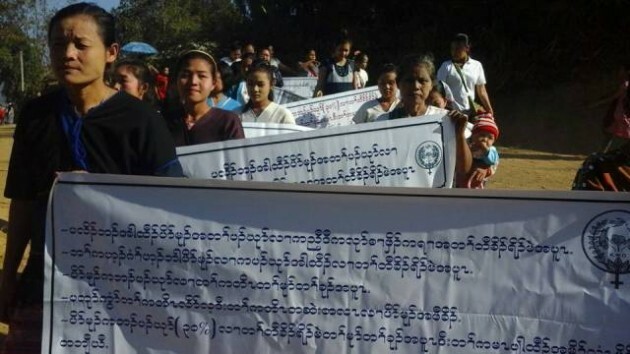 To mark International Women’s Day, Karen women’s groups demand involvement in the Burma peace building process and reminded politicians to keep their promise of giving women a 30% stake in the process. International Women’s Day ceremonies were widely held in KNU controlled areas and in refugee camps along the Thai-Burma border on March 8, organized by the Karen Women’s Organization (KWO). The KWO issued a statement recognizing and paying tribute to women around the world fighting for women’s rights, equality, justice and women’s participation in decision making at all levels. The KWO statement called on the Karen National Union, other ethnic armed organizations and the Burma government to make a Pledge of Parity, a theme for International Women’s Day in 2016, to fulfil their commitment of equality for women leadership and 30 % representation in the peace process. The KWO statement pointed out that the government delegations at every ceasefire negotiations table over the past four years demonstrated failure to meet what they have committed to. In marking this International Women’s Day, Karen women organized events that included parades, public speeches, debates and essay competitions in the KNU controlled areas of Taungoo, Nyaunglebin, Papun and in Mae Rama Luang, Umphiem Mai, Tham Hin and Nu Po refugee camps. Naw Si Yo Paw, joint secretary of the KWO spoke to Karen News. Naw Si Yo Paw said that she believes these events, will not only let women understand their rights, but also help men to understand. Naw Si Yo Paw said it is important that the struggle of women and role of women be properly recognized. According to Naw Baw Nyaw, a member of the KWO at Umphiem refugee camp, the International Women’s Day event was attended by more than 300 refugees. International Women’s Day was first recognized after women garment workers in the US city of New York, demonstrated on March 8,1908 for a reduction in their working hours, for raising their salaries and for the right to vote.